There are more than 1500 species of bees native to Australia and where I live we often see a wide variety of bees foraging in the garden. We have honey bees, which are an introduced species, the solitary bees - teddy bear bees and blue banded bees, and the most common of the social native bees, the stingless bee, Tetragonula, sometimes called sugarbag bees. 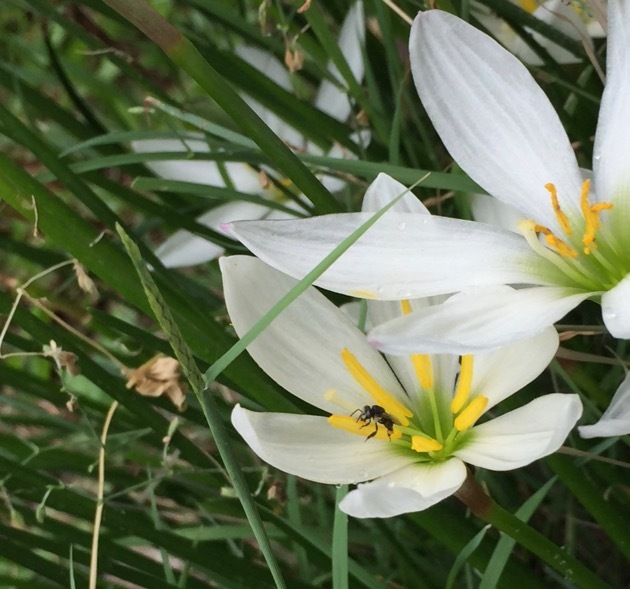 I took the photo above yesterday morning when these tiny bees (about the size of a mosquito) were out and about collecting pollen from the storm lilies. I was going to offer you a post from the Tasmanian CWA's page but it's all so good, I'll give you the entire page. There is everything from the tough political questions to a recipe for lamingtons. The page isn't updated anymore by the look of it but there are some real gems nonetheless. Enjoy! If you live near Toowoomba or don't mind the drive to get there, Simple Living Toowoomba regularly meets at the Lutheran Church in Toowoomba. I've been to a couple of their workshops and have thoroughly enjoyed the experience. They're a great bunch of women who will make you feel welcome. They haven't updated their webpage for the year yet, be patient, it will happen, but I've been told they have a soap making workshop tomorrow and a bee keeping workshop soon. To contact the group, email me and I'll give you Margy's email address or message nannachel at the Down to Earth forum. Thanks for visiting this week but now let's all sit back and enjoy the weekend. See you all next week! You got me at the teddy, Rhonda! What a love! Haven't got any further with your nice links, off to look for yarn and needles! Enjoy your weekend, we're still working on Thursday here in Michigan! Thanks for the links, Rhonda. We are having a bee keeping workshop at our Simple Living Toowoomba group in the next few months. Tomorrow though we have soap making which should be fun. Have a relaxing weekend. Lovely links this week Rhonda. Thanks for sharing them. I particularly enjoyed the Urban Exodus although I am swinging between inspiration and despair. That I'm not really living life true to me but also that I have the power to change my situation or at the very least my mindset. I'm looking forward to seeing where you will be in Tas and hoping that I'll be able to meet you. Thr milkwood post was nourishment for the soul. Thank you Rhonda, have a lovely weekend. I have just read the article on the concerns about Microbeads. I keep hearing this term, understand they are in some cosmetics and toothpaste. But, what are they, are what are they and why are they in those products? How do we know they are there? Are they mentioned on a label on the product so we know to avoid buying that one? I am very confused! There is a lot of information on the internet, Linda. Just google "microbeads". Microbeads are used as sn abrasive in cosmetics and toothpastes.so if something says its a facial scrub etc there's a possibility that it contains microbeads. Minute pieces of plastic that accumulated in the food chain.